Fish with Capt. Larry Aleman at The Mexican Gulf Fishing Company. $1800 + fuel per day for a blue water, offshore adventure on the Gulf of Mexico. Note: Our charter trips are booked online, and secured with a credit card. Check Larry's calendar now! All deposits must be paid by credit card. Balances on each trip may be paid by cash, check, or credit card. Captain Larry Aleman, a Louisiana native grew up spending weekends in Venice, LA before Venice, LA was known as a big deal. His dad was a sea plane pilot for Halliburton, and dad knew the Venice area was a perfect spot for big-time sport fishing. So he bought some property, purchased a boat, and brought the family down to the lower tip of Louisiana for weekend getaways. Those days are what stand out in Larry's mind, and he says, "it's exactly what inspired me to become an offshore charter captain." "I got the bug at a very early age. I caught my first tuna when I was seven, and I've grown up around this place." Yes, Captain Larry has seen Venice's legend and lore grow. From the days when it was just his family and a few others venturing out on small boats into the vast wonders of deep sea canyons, trough the days of a burgeoning charter fishing scene, and into the present where Venice is known as the Tuna Fishing Capital of the World — Larry has seen, and done it all. "Venice was our playground, and on many weekends we had it all to ourselves," says Larry. "This place is my back yard." And, … oh what a back yard it is! Open water, as far as the eye can see. Near shore rigs hiding reef fish, floating rigs, a fleet of commercial shrimp boats - providing key trolling opportunities, and blue water, deep sea floating rigs which attract some of the biggest fish in the USA. For many fishermen, Venice isn’t just the best place for Louisiana fishing; it’s the best place to fish, period. The town has achieved its mythical status as a destination for outdoorsmen, and each year, magazines like Marlin, Field & Stream and Outdoor Life put Venice on their best-of lists. When asked what attracted him to offshore fishing, he says: "it's the rush, the adventure, and the unpredictability of it all — you never know what you're gonna get, but you do know you're going to have an interesting time. The rewards can be awe inspiring." Running on open water in his 37ft Freeman Boatworks catamaran is one of Larry's favorite things to do. He loves the look in first timers faces when he hits the throttle, and they lay back on those E-Sea Rider marine bean bags with broad smiles on thei faces with anticipation of the big fish they're about to meet. 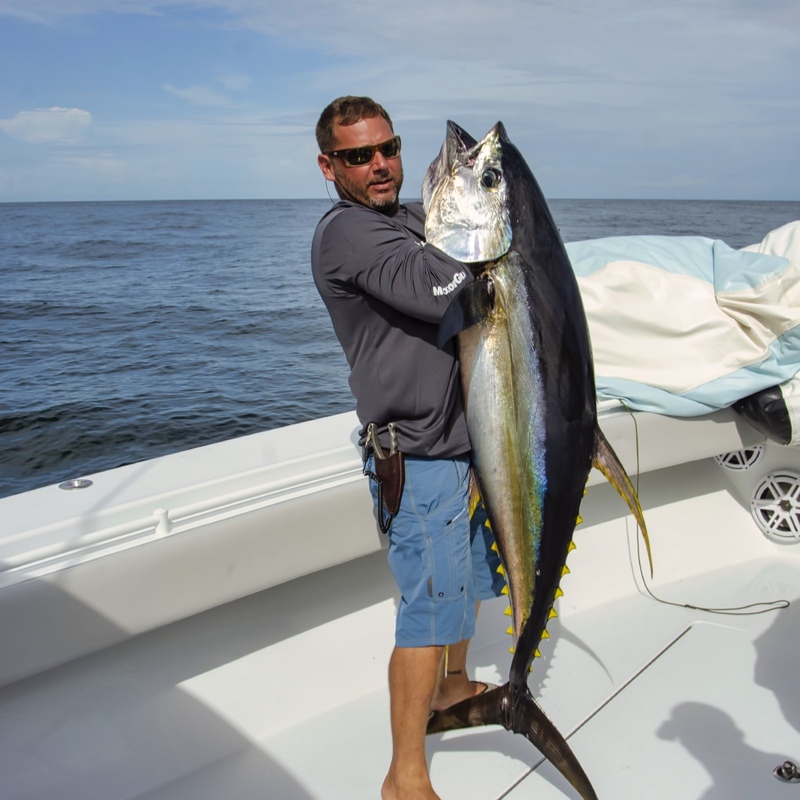 What types of fish will you catch when going offshore with Captain Larry Aleman? Yellowfin tuna, blue marlin, white marlin, swordfish, tilefish, mahi-mahi, cobia, amberjack, red snapper, mangrove snapper, and more. Larry's vessel, the f/v Jobsite, is a 37ft Freeman powered by four Mercury outboards. His advice to would be charter groups: come hungry, come happy, let us know what you want to target, and be open to our insight / suggestions. Weekdays are great because of lighter crowds. October shrimp boat season can be awesome, but it really can be good November - March, where he notes, those are the months when he most often sees 200+ lb tuna. Spring and summer generally offer calmer waters, and consistent action, but even in rolling seas and wind, Larry reminds customers "these Freemans, they can get us anywhere we wanna go. We can outrun storms, and usually be the first boats to any rig we all know to be hitting based on their build and performance." Book an offshore trip with Captain Larry Aleman. $1,800 / per day + fuel. Fuel average varies depending on prices at the dock. Budget $1,000 as a guestimate, and note: the real range runs between $750 - $1,250 per day.